The sculpture, which is being restored this year, will be more easily seen after the trimming or removal of some surrounding trees. SKOWHEGAN — Tentative plans were approved by selectmen Tuesday night for a small park that would improve the visibility and appearance of the Skowhegan Indian sculpture. And it won’t cost taxpayers any money. Dugan Murphy, executive director at Maine Street Skowhegan, a downtown revitalization group, presented the board with a sketch of the plans that will not affect existing parking in the area in front of the Indian. The only caveat is that the final work would go out to a public bid, Selectman Newell Graf said. “I want to make sure we’re not just handing it to somebody,” Graf said. The rest of the board agreed, noting that at least two bids must be presented to do the work, as a matter of town policy. The park’s cost would be about $11,000, to be funded through fundraising efforts by Main Street Skowhegan, Murphy said. Now just about $500 shy of the goal of $65,000 to complete the restoration of the statue, Murphy said his group and partner Chamber of Commerce are ready to improve the area. 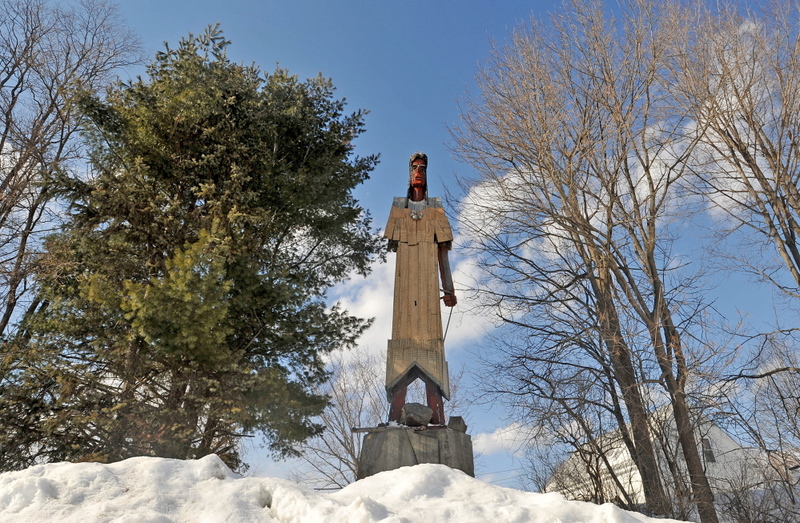 Murphy took a plan to selectmen in September that proposed to include the entire parking lot behind Cumberland Farms to improve the downtown site where the 62-foot wooden statue stands. It was not received warmly. The idea, then as now, Murphy said, is to open up the area where the sculpture stands so it is attractive and easily seen. Plans in September called for trimming or removing trees, erecting a fence behind the Cumberland Farms store on Madison Avenue, moving Dumpsters and increasing parking. A raised pedestrian walkway down the middle of the parking lot was proposed, linking it to $400,000 in state-grant rehabilitation work scheduled for the municipal parking lot across High Street. Selectmen weren’t buying the idea. “I’ll never buy into a pathway down the center,” Graf said in September, and it was back to the drawing board for Murphy and Main Street. The new plan calls for a 4-foot area directly in front of the statue that would be raised slightly to meet the bottom of the sculpture. The area would be held in by a stone retaining wall, which also would serve to keep people off the statue itself, Murphy said. Some trees would be removed at either end of the small park for better visibility. There would be an area for viewing the iconic sculpture in a 12-by-8-foot spot that would be paved in landscape stone with a granite bench, shrubbery and new signs describing the sculpture and the artist, Bernard Langlais. All the land in question is owned by the town. The sculpture’s actual footprint is owned by the Chamber, which also owns the statue. Walter Hight owns the rest of the land that abuts the sculpture. “The idea behind this plan is responding to people who have been saying restoration sounds great, but you can’t see the sculpture right now with all those trees,” Murphy said. Restoration work on the Indian is set to begin this summer. 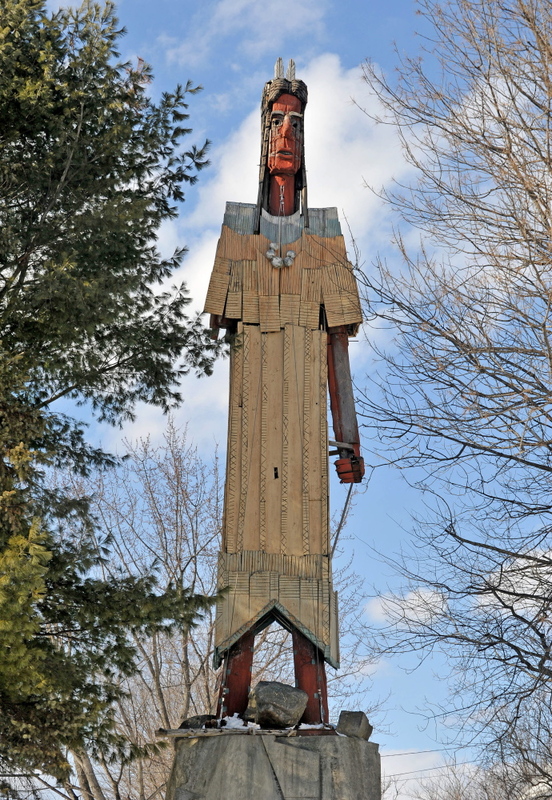 The Indian, completed by Langlais in 1969 as a tribute to Maine’s American Indian tribes, stands on a 28-foot-long concrete base. Billed as the world’s tallest statue of an American Indian, it borders land owned by Hight auto dealerships, Cumberland Farms, the shared U.S. Department of Agriculture and Department of Conservation service offices and a doctor’s building.